Kom ta et skritt tilbake i tid og slapp av i vår 175 år gamle historiske tømmerhytte. Det er en original struktur til vår gård med ekstra moderne bekvemmeligheter. Enten det er en rolig kveld på verandaen, en dukkert i bassenget om natten under stjernene eller kaffe med dyrene, er du sikker på å nyte oppholdet på gården din mens du opplever livet i en hytte som det kunne ha vært i tidlig på 1800-tallet. Vår historiske hytte kan sove 4 komfortabelt. Det er 2 full size-senger (husk folkens, de store sengene eksisterte ikke da), men våre er komfortable! Den sovende ordningen er en seng i hytteens hovedområde og en seng på loftet (som nås av en stige). Hytta har en komplett kjøkken og sjarmerende bad med en gammel klo fot badekar og en periode bad fixture (håndholdt - dusjer eksisterte ikke da). Som gjest på gården vår er du velkommen til å vandre rundt. Hele gården er din. Du kan nyte bassenget når som helst, bland med dyrene eller slapp av på verandaen på hytta. My family loved the farm. The history, serenity and the animals, a perfect Spring Break escape. We explored the property and visited Historical Washington. The best thing about this cabin is the host. It's the little details that make the stay even more special in this Historical Cabin. We would return in a minute and wish it were a bit closer to Illinois. 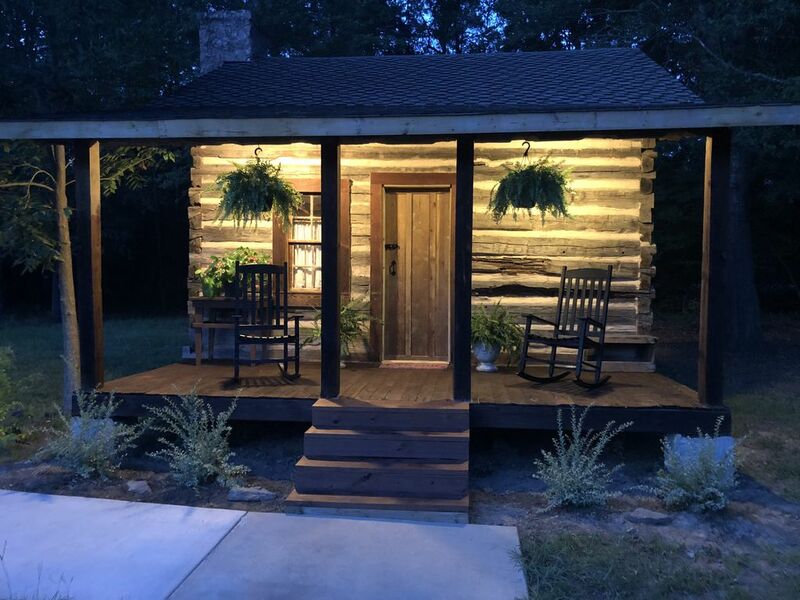 It's a historic cabin nestled in the words of a pioneer area with best services in totality. Brad makes customer satisfaction his top priority for sure. The cabin we stayed in was made of logs and accurate to the time period plus the conveniences of electricity, heating and Air conditioning. The Cabin is spacious and are equipped with all the modern facilities you must have. Brad and staff was so helpful and courteous. Go start your own fire and memories! In addition, thank you Brad! 5 Stars! Lovely, peaceful farm, gracious host. Stayed one night, 11/3/2018, next time am staying a week. The attention to detail (cabin, grounds, food, communication) illustrates the passion the owner/manager has to make your stay memorable. Thank you Bradley! This is the most enjoyable and pleasant place to stay!!! The owner is so kind, and the history behind this property is really awesome! The animals are enjoyable as well. We really loved it. It was peaceful, quiet, and so lovely. We will definitely be back! The cabin was top notch. All the amenities were wonderful! The beds were so comfortable! We can't wait to go back! This is by far our favorite place now!!!!! No complaints! Just beautiful. Loved the cabin and pool. Heather, I am so glad you and your son had a great time. It was my pleasure to host you. Please come again soon - our doors are always open!! Safe travels and see you soon!! Super place - would live there if I could. Coulter Farmstead is a perfect place for someone searching for a peaceful, quiet, and comfortable get-away. I attended the nearby bladesmithing class and this was a close, comfortable cabin. I had the chance to stay in both log cabins. Each was charming, very comfortable including the beds, and nicely furnished. Breakfast was always good and presented nicely on a tray. Kitchens were adequately equipped with full sized refrigerators, small ovens/ranges, dishes, cookware, etc. I plan to stay there during my next vacation. Highly recommended! Thanks so much for staying with me on the farm. It was my pleasure to host you during your stay. Please come again if ever in this area. My doors are always open to welcome you back! Have a great rest of 2018! !